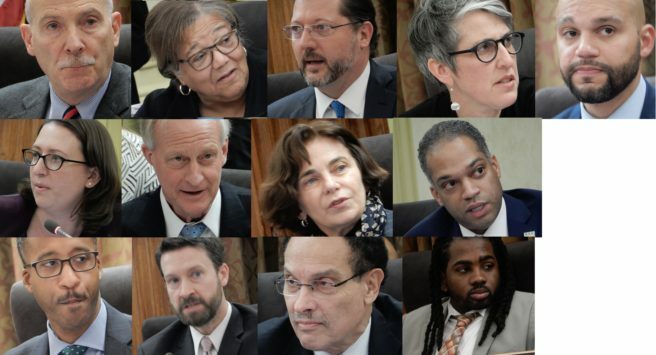 At the first Legislative Meeting of the two-year session known as Council Period 23, much of the meeting was taken up by the introduction of measures just beginning (or beginning anew) the legislative process. These measures must successfully wend their way through the legislative process before taking effect. The exception to the rule: a needed piece of emergency legislation that provided a fix to a problem the federal government shutdown exposed. Since the federally-funded DC Superior Court issues DC marriage licenses, and these same services were deemed non-essential by the federal government, marriages in the District had been stymied since the shutdown began. By allowing the Mayor’s office to issue marriage licenses, the emergency legislation provides for continued matrimony even in times of a non-functioning federal government. In regards to the flurry of new legislation introduced at the most recent meeting, Council rules generally restrict each councilmember to introducing just three new bills per meeting from the dais. (Members can introduce unlimited legislation by filing paperwork in the Council’s Office of the Secretary, but Members often prefer to introduce bills in the public venue of the Council Chamber.) However, just for the first meeting of the Council Period, the Council waived the three-bill rule and allowed each Councilmember to introduce unlimited bills within a ten-minute window. The bounty of legislation listed below is what resulted. The Council’s next Legislative Meeting will be held on February 5. For a full list of votes taken at the most recent meeting, please click here. Create a Bedbug Control Act aimed at curbing the spread of the creatures: making clear owner responsibilities regarding notifications, remediation, etc. Transfer the name “Joy Evans Therapeutic Recreation Center” from one facility to another such facility closer to her former home.